KAMPALA, Sep 17 2014 (IPS) - When Abudu Zikusoka was a small boy his father would bring people to their home in Ndesse village in Central Uganda’s Mukono district. He would watch as they packed the family’s harvested coffee into sacks and then loaded it onto their bicycles. “I used to see one of them giving daddy money from which he took out some coins to give my sister,” Zikusoka tells IPS. “When my brother started going to school, daddy continued with the practice until one day I asked my sister where she was taking the money,” he remembers. His sister explained that the money was meant for school fees that had to be paid at the beginning of each term. This is why Zikusoka decided to embrace coffee farming after his father gave him a half hectare piece of land when he married in 2005 — he wanted to be able to support his family too. On his piece of land, also in Ndesse village, Zikusoka was able to plant coffee trees and crops such as bananas, cassava and maize which became the main source of income for his family. Thanks to the profit from his farming Zikusoka was also able to buy an additional hectare of land. 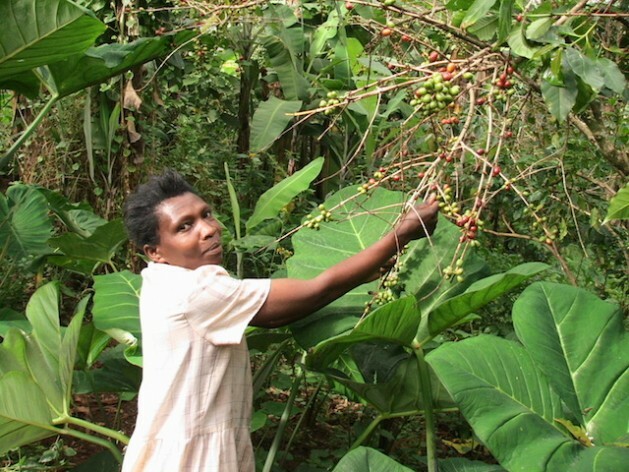 Coffee is Uganda’s single-largest export earner. This East African nation is the largest exporter of coffee on the continent as Ethiopia consumes more than half of what it produces. 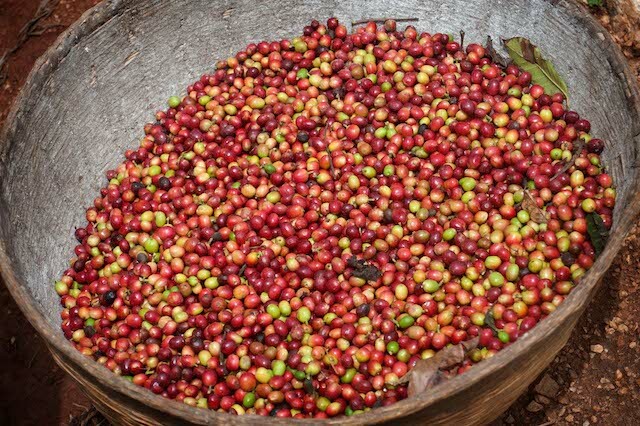 The Uganda Coffee Development Authority (UCDA) estimates that 85 percent of all coffee produced in Uganda is mostly from smallholder farmers, the majority of whom own fields ranging from 0.5 to 2.5 hectares. The sector employs 3.5 million people. But now it seems as if the good times are at risk from a changing climate. “The yields are so poor, they are affected by diseases and pests almost all the time and when the rains take a long to fall, it becomes hard… The worst is that we were hit by the coffee wilt last year and I lost everything,” Zikusoka says in frustration. “I haven’t been able to harvest much coffee like it was in 2006 when I had just started focusing on coffee as a commercial crop,” Zikusoka explains. He is one of the many farmers who have recently been affected the black coffee twig borer and coffee wilt diseases in Mukono district, one of Uganda’s commercial coffee-growing districts. Wilt first attacked Uganda’s Robusta coffee in 1993 and has destroyed over 12 million plants since then. However, it is believed this figure is underreported. 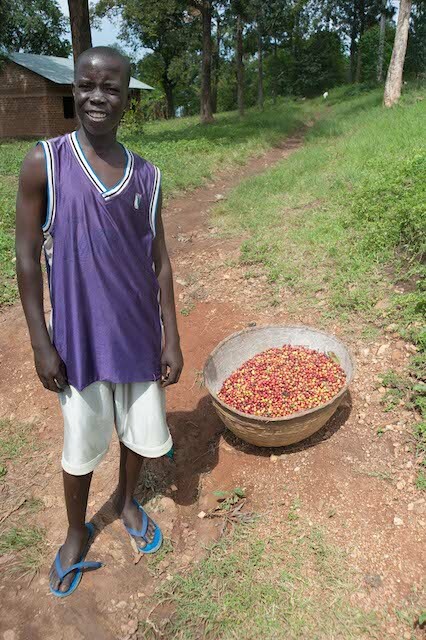 “Before the coffee wilt attacked my crop, I used to earn between 700 to 1,000 dollars in a good season but the remaining trees [not affected by the wilt] have earned me only 250 dollars, and now I don’t know if I will be able to earn more,” he adds. Zikusoka has come to the National Coffee Research Institute (NaCORI) in Kituuza, Mukono district, to find out if he can access the improved varieties developed here that are resistant to coffee diseases, which have now become tolerant to high temperatures. Last month, when the Intergovernmental Panel on Climate Change (IPCC) Fifth Assessment Report was released in Kampala, Uganda’s capital, scientists noted that incidences of pests and diseases appear to have increased here because of climate change. According to Dr. Africano Kangire from NaCORI, it appears that the warmer than usual weather is creating a breeding ground for pests and disease. The report attributes the rise in temperature to increased global warming, fuelled mainly by human activities such as clearing forests for settlement and charcoal burning, among others, which has seen increasing concentrations of greenhouse gases in the atmosphere. “High temperatures provide favourable conditions for the breeding of pests and diseases, which are affecting coffee production. We have seen incidences where diseases like malaria are now rampant in the highlands which weren’t the case before, although this is for the medical professional to elucidate,” says Kangire. According to Kangire, Uganda’s temperatures have been erratic and increasing over the years. He says if temperatures hit the two degrees Celsius level, as predicted, it could render Robusta coffee cultivation in Uganda’s lowlands very difficult while limiting it to few locations in the much cooler highlands. He further explains that coffee leaf rust disease, which has long been known to affect coffee at altitudes lower than 1,400m above sea level, has now surfaced at 1,800m above sea level. This, he explains, is evidence of rising temperatures in the country, since logic shows that the higher you go, the cooler it becomes. He adds that the coffee berry disease, which is known to affect Arabica coffee, has also shifted to higher altitudes to attack crop cultivated 1,800m above sea level — it previously only appeared at 1,600m above sea level. Dr. Revocatus Twinomuhangi, is one of the scientists who contributed to the IPCC report and is also the Climate and Development Knowledge Network (CDKN) country engagement leader and a lecturer at Makerere University Centre for Climate Change Research and Innovations. “We are witnessing a shift in production of crops such as coffee, tea. Maize, for example, coffee was mainly for highland areas. But because people have cut down trees and cleared part of the highlands for cultivation, the crop failing and if the temperature could rise to even 1.5 degrees Celsius there will be dramatic shift from highlands to low lands like the central regions in Uganda,” he tells IPS. However, the latest UCDA report shows that Uganda’s July coffee exports earned the country revenue of 37.9 million dollars up from June’s value of 31.04 million. According to the managing director of UDCA, Henry Ngabirano, the authority has succeeded in recording some profits from the coffee sector despite the presence of coffee wilt diseases. “We are getting clonal coffee varieties resistant to the wilt because these were the most-affected while Arabic coffee, which was less affected, has remained at 10 percent production. “So the 10 percent Arabic and the other percentage of clonal coffee are keeping us in the market but we are confident that since researchers ad government have taken it up, we shall be able to adjust to effects of climate change,” Ngabirano tells IPS. While scientists at NaCORI are breeding improved coffee varieties, which include those resistant to coffee wilt, Paul Isabirye, assistant commissioner from the Department of Meteorology cautions that temperatures could have risen since the IPCC report was issued. He points out that rain is now falling at the wrong times, and the coffee beans have less time to mature. “If the coffee beans face a lot of sunshine and less rain, the beans will continue to be smaller and of lower yields,” he tells IPS.